Michael discovered his love for storytelling and writing, during a hiatus a thirty year career in architecture and construction industry. His first book, The Princess Mermaid and the Missing Sea Shells. Started when his daughter, Nicole asked how do shells get on the beach. That night he came up with the story. With three children's books published, the second being The Bridge Monster, his third ready to be published, A Long For The Ride. Michael, is currently working on another children's picture book about a flying fish, a crime fiction novel and a book of short scary stories. Besides writing, Michael has discovered abstract painting. Michael, a transplant from New England to Florida where he and his beautiful wife, three dogs and a cat reside. Along for the Ride is a children’s picture book written by Michael DiPinto and illustrated by Sue Lynn Cotton. Hugo was your typical, adventure-seeking, teenage grasshopper, one whose favorite sport was base-jumping from grass to flower petals to whatever new and exciting place he could find. He was on his own one day, with no friends around, when Hugo decided that he’d base-jump and have a bit of an adventure. When a strong gust of wind knocked Hugo out of his familiar area, however, he found himself in a desperate state of affairs. He was in the middle of a traffic intersection and narrowly missed getting squashed by a school bus. Hugo executed a mighty leap and landed on a car’s windshield. Hugo studied the man inside the car who was staring right back at him, and they each considered the other until the light changed, and the car started again. Hugo thought of jumping away again, but then he thought it might be the perfect opportunity for a grand adventure. 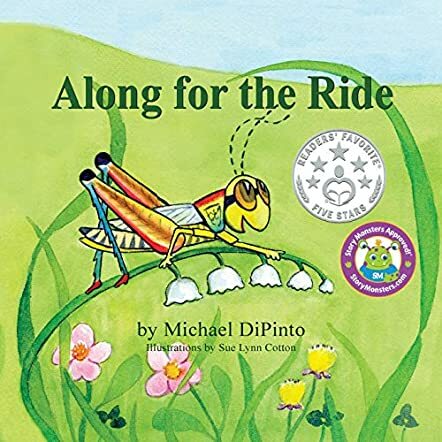 Michael DiPinto’s charming children’s picture book, Along for the Ride, shares the intrepid Hugo’s experiences as he rides on the windshield of the author’s car. I was delighted to read in the preface that the author based the book on a ride he shared with a grasshopper, and loved seeing the world through Hugo’s eyes. Sue Lynn Cotton’s illustrations work so very well with the story. I love her paintings and found myself examining every little detail on each panel. I especially appreciated the variety of facial expressions she gives to the epic traveler, Hugo, particularly when he smells the very stinky cow farm that they drive by. Along for the Ride is an imaginative feast that will have kids smiling as they follow the adventures of the teenage, base-jumping grasshopper. Along for the Ride is most highly recommended. Talk about being inspired by everyday events! When a grasshopper alighted on the windshield of Michael DiPinto’s car, instead of using his hand or his wiper blades to send the grasshopper hopping, DiPinto decided to see how long his flying companion would cling to the windshield. As he drove, he envisioned what “Hugo” (as he named the grasshopper) was seeing and feeling. His thoughts gave birth to DiPinto’s third book for children, Along for the Ride. What a delightful book it is! Hugo is a base-jumping grasshopper who loves to have fun with his grasshopper mates jumping from one blade of grass to another. But nothing quite prepares Hugo for what he’ll experience after he lands on that windshield while trying to escape the wheels of a school bus. Hugo gets a kick out of seeing folks and even dogs riding in cars all around him. He raises a wing to wave at kids on a school bus who are excitedly waving at him. When he sees a field of horses, he’s thinking how cool it would be to ride one of them. When he starts thinking it’s time to get off the windshield and contemplates jumping, he notices cows nearby and decides that with his luck, he’ll end up in the middle of a cow patty. He tries to signal to the driver that it’s time to let him off this ride but the driver is busy checking his cell phone. Typical modern human! Hugo’s adventure eventually ends, of course, but along the way, children will delight in looking at the wonderful illustrations and will enjoy Hugo’s windshield ride along with him. Along for the Ride would be a nice addition to a primary classroom as teachers and children imagine other things Hugo might experience. Highly recommended. Along for the Ride is a children’s picture book with full-color illustrations created by illustrator Sue Lynn Cotton. The watercolor pictures add pastel colors of blue and green to the pages. Author Michael DiPinto takes all of us on a scary adventure from the city into the country, past two school buses, and lots of onlookers. The car slows down and the grasshopper contemplates jumping off … can he do it safely or should he stay? What would you do? If you were the driver, would you pull your car over so the grasshopper can safely jump off? Or would you stop your car, pick up the grasshopper, and put him down in a field? If you were the driver, would you keep the grasshopper as a pet? Where is the man in the blue car going and will this ride be ending soon? Read the book to find out if the grasshopper survives this daring adventure. What a fun story about a grasshopper’s adventure on the windshield of a moving car! Told from the grasshopper’s point of view, Along for the Ride allows us to visualize all the things that he can see. Imagine being on the windshield of a speeding car? What if a gust of wind sweeps you away? Would you be scared or thrilled to be on the ride? Author Michael DiPinto is quite imaginative in describing a grasshopper’s leap of faith and landing on the windshield of a moving car. Hop into the book and jump just as a grasshopper would.